That is right, Henry VIII. Both were second sons who became crown Princes when their older brothers died. Not a lot is known about Amenhotep’s older brother (Thutmose). Some novels have him a scholar and a true prince unlike his younger and much more neurotic brother, Amenhotep. In short, Egypt would have fared better under his older brother. It is the same story we hear in historical fiction novels when the characters are talking about Henry and Arthur. Some say that if Arthur had lived, given his education and training, he would have made a better Prince but we can never know for sure. It is one of history’s many what-ifs. If it is any consolation to everyone, given that they were crown heirs, Thutmose and Arthur Tudor might have become less glamorous, but more pragmatic rulers. 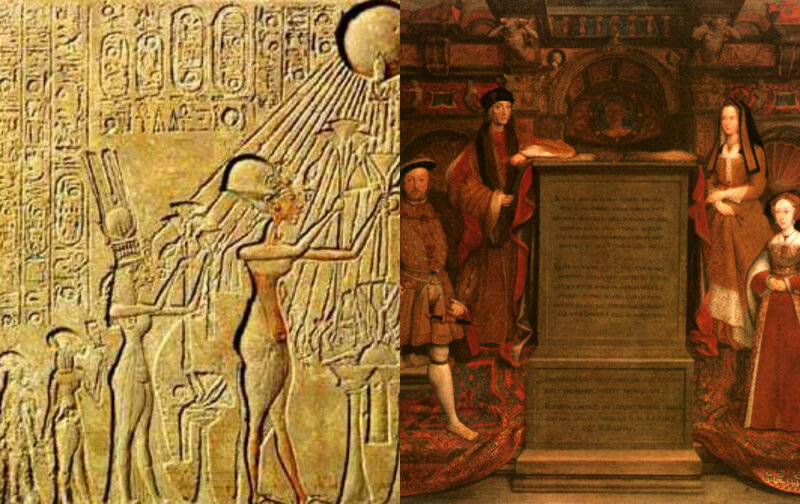 Henry VIII and Akhenaten were considered mavericks in their time because of their radical approaches to religion. The only difference is that Henry VIII still believed in the Catholic Mass and the old forms of worship whereas Akhenaten was a TRUE reformer. He really did believe that there was one god and that what he was doing was dictated by some invisible deity above. Who knows where he got his idea of the sun disk. Some say that he didn’t believe what he was doing and that like Henry VIII, he was in on it for the power. Perhaps but his actions say otherwise. He build another capital where he stayed during the last years of his reign and he disbanded many temples and got ahold of their wealth and established new temples and a new priesthood at the service of Aten (the sun disk). You might think ‘oh geesh monotheism. So no more art!’ Actually no. During his reign some of the greatest art work was produced. Just because he was a monotheist and enforced his belief down everyone’s throats, did not mean that he abandoned the glamor that he always knew. His chief wife Nefertiti is considered one of the most beautiful queens of Ancient Egypt. (But like with Anne Boleyn, some believe that her importance is overrated and that her bust was nothing more than a piece of propaganda. Like in the Renaissance, the busts and depictions of famous people took liberties with their physical appearances). Both Kings had two Queens that overshadow the others: Nefertiti and Anne Boleyn. Pharaohs could have more than one wife and whoever gave them a son first (if the chief wife did not) inherited. Henry VIII broke away with the Catholic Church but not with tradition. Some changes were made, some which were considered radical by the conservatives and thought of as heretic, but not as radical as the staunchest Protestants wanted. The Six Articles by Gardiner were made, some changes were made to the Mass, the English bible was allowed, etc. And of course there was a proliferation of art and propaganda where Henry was at the top of the divine scale. He was the representative of God on earth not the pope or the saints. With Akhenaten, he was on the top. 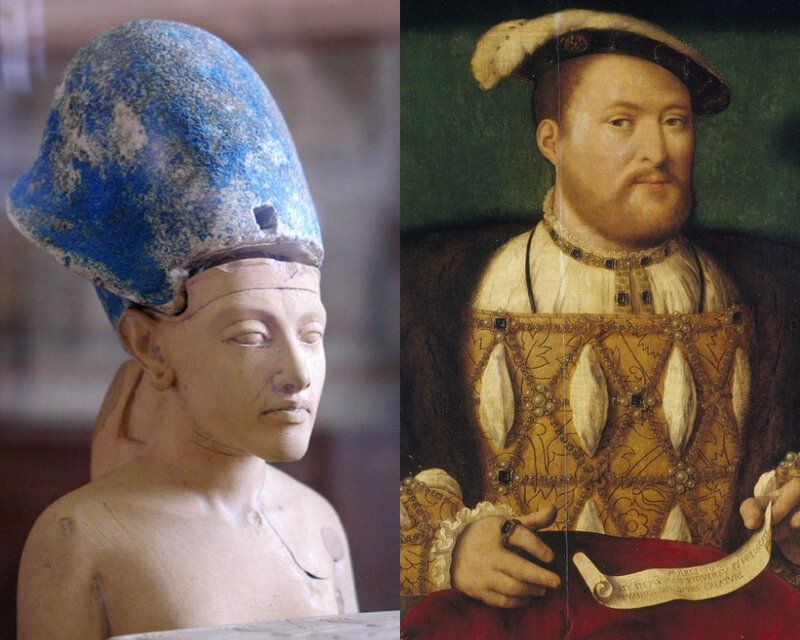 The pharaoh had always had divine status as medieval kings did before Henry VIII. Never before though was a pharaoh granted so much power and importance. And like with Henry VIII, he pissed a lot of the polytheistic clergy off when he attacked their temples and made his single form of worship official. (Left) Akhenaten and his family gloriously depicted worshiping the sun disk Aten. (Right) The “Tudor Dynasty” portrait which shows Henry VIII and his third wife -who was dead at the time- Jane Seymour and above them his parents, Henry VII and Elizabeth of York. Both paintings were done with the purpose to propagate the myth of the powerful and glorious dynasty that is being favored by the Almighty. Akhenaten prided himself as a great man, reformer, and warrior but his campaigns were not as great when compared to his predecessors and he has often been accused by historians to neglect his territories so he could continue to work on his religious policies. Henry VIII has similarly been accused by historians such as Robert Hutchinson as bankrupting the country by engaging in expensive wars which often ended in disaster. Though Henry never lost one war, he hardly ended his campaigns. The battle of the spurs was more a Pyrrhic victory. His father-in-law Ferdinand II of Aragon and Regent of Castile stabbed him in the back and his grandson Charles V did the same during the second phase of the Italian Wars when he made an agreement to end the war with Francis I of France behind his back. Sure, Henry VIII did gain Bolougne in the end but England was not able to keep it. Neither of these campaigns had the desired effect that Henry VIII wanted. But whereas Akhenaten’s enemies and the people hatred for his religious policies won in the end; Henry VIII got to keep the break with Rome. His son changed the religious landscape even more, and his youngest daughter created a more moderate establishment as a way to please both sides but she couldn’t and so she became a tough enforcer like her father and brother. 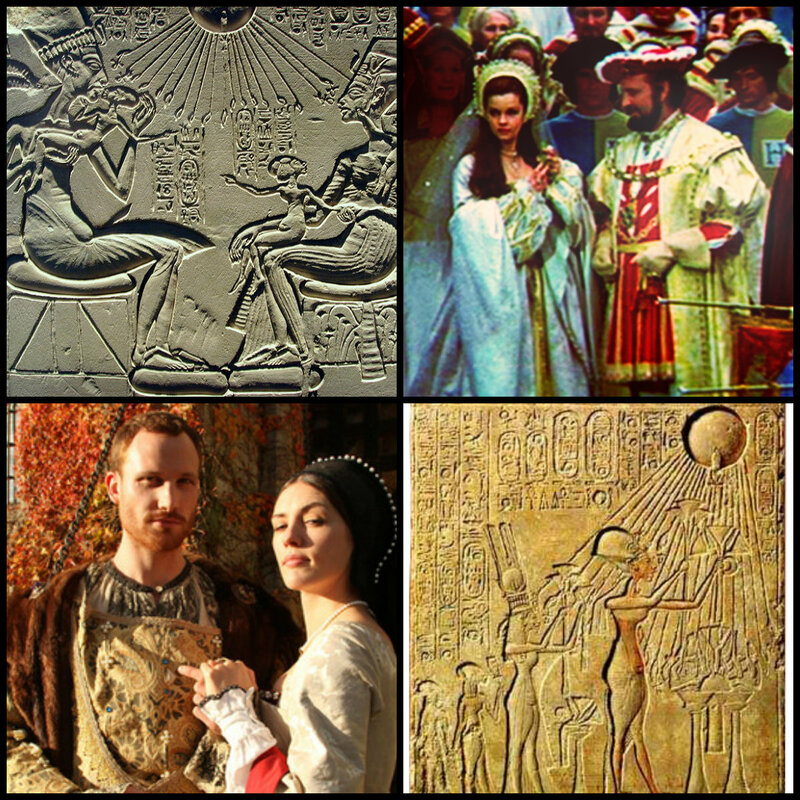 Akhenaten also had two daughters (Smenkhkare and Neferneferuaten) who reigned as Queens but whereas Mary Tudor and Elizabeth Tudor reigned after their brother, these reigned before him. The last of his offspring to reign was his young son Tutankhamun. His reign was short and tragic. He died at the age of nineteen (either of illness or murdered by his jealous general). After the reign of Neferneferuaten who continued with the religious policies of her father (albeit choosing a moderate approach like Henry’s youngest daughter Elizabeth), monotheism became extinct. There was no glorious “golden age” for either of his kids to keep the religious changes made during his reign. They were just very unpopular, people loved their gods and the priestesses and priests were too powerful to allow monotheism to flourish.